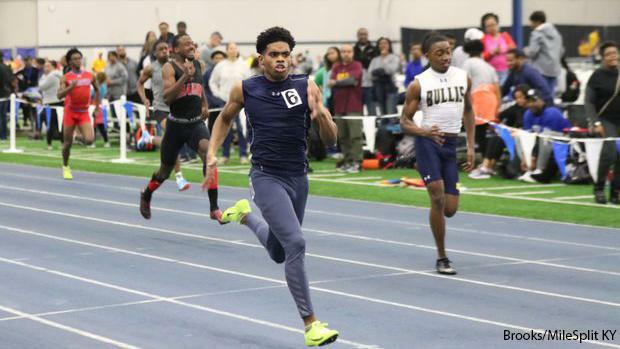 St. Louis is home to two of the nations top male sprinters, and both of them traveled to the University of Kentucky this weekend and had great performances. Lance Lang's comeback tour this indoor season has been nothing short of incredible, and he's still getting faster. On Saturday he dropped a US #1 60m time with a 6.62 which is the fastest 60m time ever recorded by a Missourian according to our database. If that wasn't impressive enough on its own, it's also the 4th fastest 60m recorded by an American High Schooler in our database. 400m star Justin Robinson also dropped a US #5 60m in that race with a 6.79, which is the third fastest 60m time ran by a Missourian. Both Robinson and Lang spiked up for the 200m as well on Saturday. Robinson just edged out Lang for third place with US #5 21.18 to Lang's US #6 21.21. Those currently sit as the top two 200m indoor times in state history, and sit 26th and 28th all-time nationally. What a weekend for those two. Jacob Brunsman of Rockwood Summit also had a great race in the 400m, placing 4th with a US #17 time of 48.66. That's the third fastest indoor 400m in state history as well, and he's already dropped a full second off of his outdoor PR from last year. The Championship meet of the MIZZOU High School Series had some spectacular results on Sunday as well. The Girls 60m Hurdles saw two of the nations best square off in the finals. Tyra Wilson of Rock Bridge came away with the victory with a US #21 8.60, and Michelle Owens took second with a US #26 8.65. Those time also have them 1st and 3rd all-time in state history as well in the 60m Hurdles. Cardinal Ritter's Rasheed Ricketts also had himself a very good day winning both the Long and Triple Jump. His 49-0.25 Triple Jump is the 10th farthest jump in the country right now, and it appears he could take a shot at 50 feet in the Spring. Courtney Williams had a strong day while winning the 60m and 200m. She currently leads the state in the 60m, 200m, and 400m, and her 60m time of 7.63 on Sunday currently sits in the top 50 nationally. You can find full results from this weekends meets here. You can also find video and photos from the UK Invite here.